For other uses, see Vril (disambiguation). 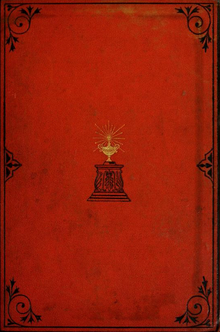 Cover of one 1871 Blackwood "edition"
The Coming Race is a novel by Edward Bulwer-Lytton, published anonymously in 1871. It has also been published as Vril, the Power of the Coming Race. Some readers have believed the account of a superior subterranean master race and the energy-form called "Vril", at least in part; some theosophists, notably Helena Blavatsky, William Scott-Elliot, and Rudolf Steiner, accepted the book as based on occult truth, in part. One 1960 book, The Morning of the Magicians, suggested that a secret Vril Society existed in Weimar Berlin. However, there is no evidence for the existence of such a society. The original, British edition of The Coming Race was published anonymously in May 1871, by Blackwood and Sons of Edinburgh and London. (Blackwood published four more "editions" in 1871.) Anonymous American and Canadian editions were published in August, as The Coming Race, or The New Utopia, by Francis B. Felt & Co. in New York and by Copp, Clark & Co. in Toronto. Late in 1871 Bulwer-Lytton was known to be the author. Samuel Butler's Erewhon was also published anonymously, in March 1872, and Butler suspected that its initial success was due to being taken as a Coming Race sequel by Bulwer-Lytton. It was revealed that Butler was the writer in the 25 May 1872 issue of the Athenaeum; as Butler was unknown at the time, sales dropped by 90 percent. The novel centres on a young, independent, unnamed, wealthy traveller (the narrator), who visits a friend, a mining engineer. They explore a natural chasm in a mine which has been exposed by an exploratory shaft. The narrator reaches the bottom of the chasm safely, but the rope breaks and his friend is killed. The narrator finds his way into a subterranean world occupied by beings who seem to resemble angels. He befriends the first being he meets, who guides him around a city that is reminiscent of ancient Egyptian architecture. The explorer meets his host's wife, two sons and daughter who learn to speak English by way of a makeshift dictionary during which the narrator unconsciously teaches them the language. His guide comes towards him, and he and his daughter, Zee, explain who they are and how they function. The hero discovers that these beings, who call themselves Vril-ya, have great telepathic and other parapsychological abilities, such as being able to transmit information, get rid of pain, and put others to sleep. The narrator is offended by the idea that the Vril-ya are better adapted to learn about him than he is to learn about them. Nevertheless, the guide (who turns out to be a magistrate) and his son Taee behave kindly towards him. The narrator soon discovers that the Vril-ya are descendants of an antediluvian civilization called the Ana, who live in networks of subterranean caverns linked by tunnels. Originally surface dwellers, they had fled underground thousands of years ago to escape a massive flood and gained greater power by facing and dominating the harsh conditions of the Earth. The place where the narrator descended housed 12,000 families, one of the largest groups. Their society was a technologically supported Utopia, chief among their tools being an "all-permeating fluid" called "Vril", a latent source of energy that the spiritually elevated hosts are able to master through training of their will, to a degree that depended on their hereditary constitution. This mastery gave them access to an extraordinary force that could be controlled at will. It is this fluid that the Vril-ya employed to communicate with the narrator. The powers of the Vril included the ability to heal, change, and destroy beings and things; the destructive powers in particular were powerful, allowing a few young Vril-ya children to destroy entire cities if necessary. Men (called An, pronounced "Arn") and women (called Gy, pronounced "Gee") have equal rights. The women are stronger and larger than the men. The women are also the pursuing party of romantic relationships. They marry for just three years, after which the men choose whether to remain married, or be single. The female may then pursue a new husband. However, they seldom make the choice to remarry. Their religion posits the existence of a superior being but does not dwell on his nature. The Vril-ya believe in the permanence of life, which according to them is not destroyed but merely changes form. The narrator adopts the attire of his hosts and begins also to adopt their customs. Zee falls in love with him and tells her father, who orders Taee to kill him with his staff. Eventually both Taee and Zee conspire against such a command, and Zee leads the narrator through the same chasm which he first descended. Returning to the surface, he warns that in time the Vril-ya will run out of habitable space underground and will claim the surface of the Earth, destroying mankind in the process, if necessary. The uses of Vril in the novel amongst the Vril-ya vary from destruction to healing. According to Zee, the daughter of the narrator's host, Vril can be changed into the mightiest agency over all types of matter, both animate and inanimate. It can destroy like lightning or replenish life, heal, or cure. It is used to rend ways through solid matter. Its light is said to be steadier, softer and healthier than that from any flammable material. It can also be used as a power source for animating mechanisms. Vril can be harnessed by use of the Vril staff or mental concentration. A Vril staff is an object in the shape of a wand or a staff which is used as a channel for Vril. The narrator describes it as hollow with "stops", "keys", or "springs" in which Vril can be altered, modified, or directed to either destroy or heal. The staff is about the size of a walking stick but can be lengthened or shortened according to the user's preferences. The appearance and function of the Vril staff differs according to gender, age, etc. Some staves are more potent for destruction; others, for healing. The staves of children are said to be much simpler than those of sages; in those of wives and mothers, the destructive part is removed while the healing aspects are emphasised. The book was quite popular in the late 19th century, and for a time the word "Vril" came to be associated with "life-giving elixirs". The best known use of "Vril" in this context is in the name of Bovril (a blend word of Bovine and Vril). From 5 to 7 March 1891, there was even a "Vril-ya Bazaar" held at the Royal Albert Hall in London. Now, as some bodies are charged with electricity like the torpedo or electric eel, and never can communicate that power to other bodies, so I suppose the existence of a race charged with that electricity and having acquired the art to concentre and direct it in a word, to be conductors of its lightnings. If you can suggest any other idea of carrying out that idea of a destroying race, I should be glad. Probably even the notion of Vril might be more cleared from mysticism or mesmerism by being simply defined to be electricity and conducted by those staves or rods, omitting all about mesmeric passes, etc. Bulwer-Lytton has been regarded as an "initiate" or "adept" by esotericists, especially because of his Rosicrucian novel Zanoni (1842). However, there is no historical evidence that suggests that Bulwer-Lytton can be seen as an occultist, or that he has been the member of any kind of esoteric association. Instead, it has been shown that Bulwer-Lytton has been "esotericized" since the 1870s. In 1870, the Societas Rosicruciana in Anglia appointed Bulwer-Lytton as her "Grand Patron." Although Bulwer-Lytton complained about this by letter in 1872, the claim has never been revoked. Other claims, such as his membership in a German masonic lodge Zur aufgehenden Morgenröthe, have been proven wrong. Those claims, as well as the recurrent esoteric topics in Bulwer-Lytton's works, convinced some commentators that the fictionalised Vril was based on a real magical force. Helena Blavatsky, the founder of Theosophy, endorsed this view in her book Isis Unveiled (1877) and again in The Secret Doctrine (1888). In Blavatsky, the Vril power and its attainment by a superhuman elite are worked into a mystical doctrine of race. However, the character of the subterranean people was transformed. Instead of potential conquerors, they were benevolent (if mysterious) spiritual guides. Blavatsky's recurrent homage to Bulwer-Lytton and the Vril force has exerted a lasting influence on other esoteric authors. When the theosophist William Scott-Elliot describes life in Atlantis in The Story of Atlantis & The Lost Lemuria (first ed. ), 1896 , the aircraft of the Atlanteans are propelled by Vril-force. His books are still published by the Theosophical Society. Scott-Elliot's description of Atlantean aircraft has been identified as an early inspiration for authors who have related the Vril force to UFOs after World War II. George Bernard Shaw read the book and was attracted to the idea of Vril, according to Michael Holroyd's biography of him. French writer Jules Lermina included a Vril-powered flying machine in his L'Effrayante Aventure [Panic in Paris] (novel) (in French), 1910 . A stage adaptation of the book was written by journalist David Christie Murray and magician Nevil Maskelyne. The production premiered at Saint George's Hall in London on 2 January 1905. Both Nevil Maskelyne and his father John Nevil Maskelyne collaborated on the special effects for the play. The play did not meet with success and closed after a run of eight weeks. Willy Ley was a German rocket engineer who had emigrated to the United States in 1937. In 1947, he published an article titled "Pseudoscience in Naziland" in the magazine Astounding Science Fiction. He wrote that the high popularity of irrational convictions in Germany at that time explained how National Socialism could have fallen on such fertile ground. Among various pseudoscientific groups he mentions one that looked for the Vril: "The next group was literally founded upon a novel. That group which I think called itself 'Wahrheitsgesellschaft' — Society for Truth —and which was more or less localised in Berlin, devoted its spare time looking for Vril." The existence of a Vril Society was alleged in 1960 by Jacques Bergier and Louis Pauwels. In their book The Morning of the Magicians, they claimed that the Vril-Society was a secret community of occultists in pre-Nazi Berlin that was a sort of inner circle of the Thule Society. They also thought that it was in close contact with the English group known as the Hermetic Order of the Golden Dawn. The Vril information takes up about a tenth of the volume, the remainder of which details other esoteric speculations, but the authors fail to clearly explain whether this section is fact or fiction. Historians have shown that there has been no actual historical foundation for the claims of Pauwels and Bergier, and that the article of Willy Ley has only been a vague inspiration for their own ideas. Nevertheless, Pauwels and Bergier have influenced a whole new literary genre dealing with the alleged occult influences on National Socialism which have often been related to the fictional Vril Society. In his book Monsieur Gurdjieff, Louis Pauwels claimed that a Vril Society had been founded by General Karl Haushofer, a student of Russian magician and metaphysician Georges Gurdjieff. The book of Jacques Bergier and Louis Pauwels was published in German with the title: Aufbruch ins dritte Jahrtausend: von der Zukunft der phantastischen Vernunft (literally Departure into the Third Millennium: The Future of the Fantastic Reason) in 1969. In his book Black Sun, Professor Nicholas Goodrick-Clarke refers to the research of the German author Peter Bahn. Bahn writes in his 1996 essay, "Das Geheimnis der Vril-Energie" ("The Secret of Vril Energy"), of his discovery of an obscure esoteric group calling itself the "Reichsarbeitsgemeinschaft", which revealed itself in a rare 1930 publication Vril. Die Kosmische Urkraft (Vril, the cosmic elementary power) written by a member of this Berlin-based group, under the pseudonym "Johannes Täufer" (German: "John [the] Baptist"). Published by the influential astrological publisher, Otto Wilhelm Barth (whom Bahn believes was "Täufer"), the 60-page pamphlet says little of the group other than that it was founded in 1925 to study the uses of Vril energy. The German historian Julian Strube has argued that the historical existence of the "Reichsarbeitsgemeinschaft" can be regarded as irrelevant to the post-war invention of the Vril Society, as Pauwels and Bergier have developed their ideas without any knowledge of that actual association. Strube has also shown that the Vril force has been irrelevant to the other members of the "Reichsarbeitsgemeinschaft," who were supporters of the theories of the Austrian inventor Karl Schappeller (1875–1947). After World War II, a group referred to by Nicholas Goodrick-Clarke as the Vienna Circle elaborated an esoteric neo-Nazism that contributed to the circulation of the Vril topos in a new context. In their writings, Vril is associated with Nazi UFOs and the Black Sun concept. Julian Strube wrote that a younger generation related to the Tempelhofgesellschaft, has continued the work of the Vienna Circle and exerts a continuous influence on the most common notions of Vril. Those notions are not only popular in neo-Nazi circles but also in movies or computer games, such as Iron Sky, Wolfenstein, and Call of Duty. ^ a b Blackwood published five "editions" dated 1871, all 292 pages (perhaps impressions or printings of one edition), one in 1872, and two in 1873, 280 pages. See WorldCat library records indexed as 1871 to 1874 ("Formats and Editions ..."). For instance, records OCLC 943154319, 7791481, and 946735485, report copies of the 2nd, 5th, and 8th editions. William Blackwood and Sons, Edinburgh and London. Five days later The Scotsman published a version of the data, as "This day", above an excerpt from a review in the Daily News (p. 8). In The Observer for 21 May it was "Just published" (p. 1). ^ a b "The coming race" (first edition). Library of Congress Online Catalog. Retrieved 2017-12-20. Apparently that record reports a copy of the 1st "edition" where LCCN 09-12503 reports a copy of the 4th "edition", perhaps 1st and 4th printings of the first edition. ^ Classified advertisement (New Publications). The New York Times, 9 August 1871, p. 6. Quote: "Published This Day". Price $1.25. ^ Classified advertisement (Books and Stationery). The Globe (Toronto), 8 August 1871, p. 2. Quote: "Ready in a Few Days". Price 50 cents (C$0.50). ^ Redfield, Marc (1996). Phantom Formations: Aesthetic Ideology and the Bildungsroman. Cornell University Press. p. 170. ISBN 978-0-8014-3236-1. ^ Bulwer Lytton, Edward. "Vril: The Power of the Coming Race". wikisource.com. Retrieved 25 June 2016. ^ Seed, David; Bulwer‐Lytton, Sir Edward (2007) , The Coming Race, Wesleyan University Press, pp. xvii, 159 . ^ Hadley, Peter (1972), A History of Bovril Advertising, London: Bovril, p. 13 . ^ Lytton, Victor Alexander Robert (1913), The Life of Edward Bulwer Lytton, First Lord Lytton, vol. 1, London: Macmillan and Co., p. 466f . ^ Strube (2013), 69ff., 77ff. ^ de Camp, L Sprague (1954), Lost Continents (first ed. ), p. 67 . ^ Steinmeyer, Jim (2004), Hiding the Elephant: How Magicians Invented the Impossible and Learned to Disappear (trade paperback), Carrol & Graf, pp. 184–85 . ^ Ley, Willy (May 1947), "Pseudoscience in Naziland", Astounding Science Fiction, 39 (3): 90–98 . ^ Pauwels, Louis, Monsieur Gurdjieff (in French), FR: Amazon, ASIN 2226081968 . ^ Bahn, Peter (1996), Schneider, Adolf; Schneider, Inge (eds. ), "Das Geheimnis der Vril-Energie: Berichte und Erfahrungen zu einer mächtigen Naturkraft", Vorträge des Kongresses 1995 im Gwatt-Zentrum am Thunersee, Bern: Jupiter-Verlag A.+l. Schneider, pp. 137–46, ISBN 978-3-906571-14-0 . Goodrick-Clarke, Nicholas (2002). Black Sun: Aryan Cults, Esoteric Nazism and the Politics of Identity. New York: New York University Press. ISBN 978-0-8147-3155-0. Strube, Julian (2013). Vril: Eine okkulte Urkraft in Theosophie und esoterischem Neonazismus. Paderborn/München: Wilhelm Fink. ISBN 978-3770555154. Sünner, Rüdiger (2001). Schwarze Sonne: Entfesselung und Mißbrauch der Mythen in Nationalsozialismus und rechter Esoterik. Freiburg: Herder. The Coming Race at Project Gutenberg – transcript of unidentified edition that was published as "by Edward Bulwer, Lord Lytton"
Secret Flying Discs of the Third Reich, Laesie works, archived from the original on 10 October 2004 . Conspiracy archive, Vril Society . The Development of the German UFOs from before WW2, Galactic server . "The Nazi Connection with Shambhala and Tibet", Kala chakra, Study Buddhism . This page was last edited on 28 January 2019, at 00:35 (UTC).